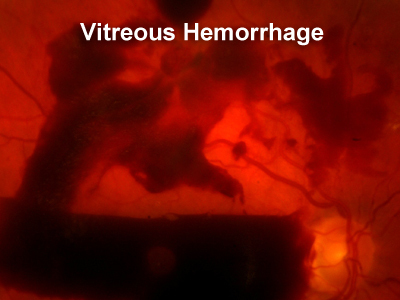 In reponse to poor circulation in the retina from diabetic retinopathy, new blood vessels sometimes grow. This is called proliferative diabetic retinopathy. Does proliferative retinopathy Always Affect Vision? No it does not always affect vision. It is possible to have advanced, sight threatening, proliferative diabetic retinopathy with normal vision. Proliferative diabetic retinopathy is an advanced for of diabetic eye disease. "Proliferative" means that there is growth, or "proliferation," of abnormal blood vessels in the back of the eye. Sometimes, very severe growth of abnormal blood vessels can also affect the front part of the eye. 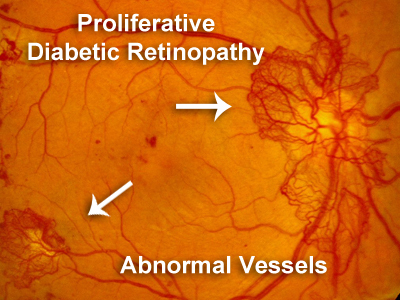 Proliferative diabetic retinopathy is a marker that diabetes has been present and poorly controlled for a long time. One of the theories that explains why abnormal new blood vessel growth occurs in diabetic eyes is that, as the normal small blood vessels in the eye become diseased and stop working well, the remaining vasculature begins to sprout new abnormal blood vessels. Often there vision is normal when proliferative abnormal blood vessel growth starts, which is one of the reasons it is vital that all diabetics receive regular dilated eye exams. Treatment for proliferative diabetic retinopathy has evolved over the last several decades. One of the most important aspects of treatment remains optimizing the blood sugar and systemic health in diabetes, since there is no way to completely stop diabetic retinopathy from getting worse when blood sugar, blood pressure, and other vascular diseases are under poor control. The mainstay of eye treatment for proliferative diabetic retinopathy remains a retinal laser procedure, called panretinal photocoagulation (PRP). PRP is performed in the office with either anesthesia drops or an anesthetic injection. It is very well-tolerated by patients, and has been shown repeatedly to reduce the risk of severe vision loss from proliferative diabetic retinopathy. 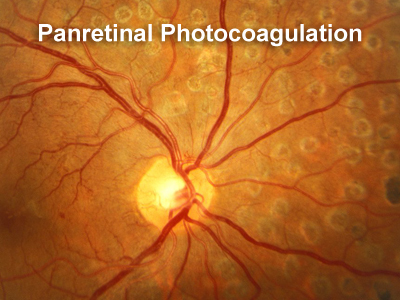 Often, several sessions of panretinal photocoagulation are necessary. It is very important to understand that PRP laser treatment is not a cure for proliferative diabetic retinopathy, as there is no known cure for diabetes or its affects in the body. PRP treatment is very safe, and often helps keep patients from more invasive and extensive surgical procedures. Like every medical procedure, there are potential risks and side-effects to PRP laser. The specific risks and benefits of this type of laser will be discussed with every patient on an individualized basis. When proliferative diabetic retinopathy is advanced, vitrectomy surgery becomes necessary. That's why screening examinations are important so patients can be treated with laser before the proliferative retinopathy becomes so severe that surgery is necessary. Surgery can substantially reduce the risk of vision loss from severe proliferative diabetic retinopathy, but it does carry a risk from 10 percent to 20 percent of severe vision loss. In addition to PRP laser, injectable therapy with anti-vascular endothelial growth factor (VEGF) medications has more recently played a role in the treatment of proliferative diabetic retinopathy. This is, at the moment, not an FDA approved treatment of proliferative retinopathy and is used sometimes to augment the affect of laser, not to replace laser. 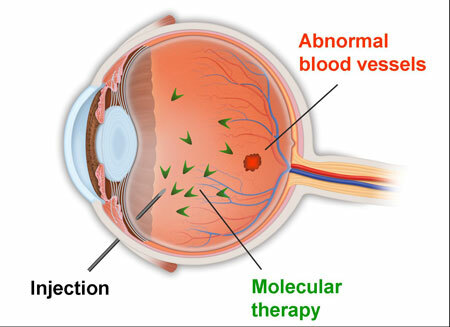 Since the mid-to-late 2000's, injections into the eye of small molecule antibody drugs have been shown to effectively treat the growth of abnormal new blood vessels. There are a variety of injectable drugs available, and these drugs are sometimes used on their own and are often combined with PRP laser treatment to cause the abnormal new blood vessels to stop growing. The injections are often used before there is extensive growth of abnormal new blood vessels. Injection therapy is administered in the office with either anesthetic drops or an anesthesia injection. It is also well-tolerated by patients, and the eye is often completely comfortable by the morning after the injection procedure. Injectable treatments often have to be repeated, as, with any medicine, the treatment effect of the injections is transient. Injection therapy similar to laser treatment, is very safe. Like any medical procedure, there are potential risks and side-effects to the injections, and these specific issues will be discussed with each patient on an individualized basis. Recently there has been evidence that after intensive injection therapy there is significant reversal of some signs of diabetic retinopathy, and injection therapy can sometimes be given less frequently over time. As injection therapy for proliferative diabetic retinopathy is relatively new, its role in the treatment of abnormal new blood vessels is going to evolve and change over time. Our practice is active in developing the best practices in injection therapy, and we have presented research involving injection dosing in diabetes at the American Society of Retina Specialists meeting in 2013 and 2014. Unhealthy Eating Habits have led to the Rising Incidence of Proliferative Diabetic Retinopathy. Mother Nature could have the answer to treating several causes of blindness. Proliferative Diabetic Retinopathy Market 2019-2025 report supplies an analysis of the competitive picture and greatest players from the regional industry. The report titled “Global Diabetic Retinopathy Treatment Market 2019” gives a proper understanding of global Diabetic Retinopathy Treatment industry. Nature is believed to hold the answers for the treatment of causes of blindness, says a study. "It goes without saying that losing your eyesight is a. A study published in the Journal of Natural Products has found that nature might have the answers for the treatment of causes of blindness. Drs Jason Hsu and Anthony Obeid on how the 25% of patients lost to follow-up are vulnerable to vision loss and other adverse outcomes. The London Economic | Plants could stop blindness caused by diabetes, being born prematurely or old age | Lifestyle. The modeled and lifetime QALY costs in the facility and out of the facility were $181144 and $107965, respectively, for PPV. DOJ announces upcoding settlement — MACPAC grouses on interop rule. Taking a closer look at PROTEUS, an intriguing study in patients with high-risk proliferative diabetic retinopathy. Intravitreal aflibercept injection showed early signs of activity for patients with moderately severe to severe nonproliferative diabetic retinopathy. The DR market is expected to accrue a sum of $2490 million by 2022, growing at a compound annual growth rate of 14.4% from 2014-2022. Results support that there is a relationship between diabetic retinopathy and Parkinson disease. Investigators assessed the time in range according to a continuous glucose monitor and the risk for diabetic retinopathy.